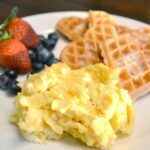 Step-by-step instructions making the fluffiest, yummiest scrambled eggs ever! Whisk eggs until all yolks are broken and well blended. Pour in half & half and add salt & pepper to taste; whisk well. Add dabs of cream cheese. Don’t try to whisk any more. Melt butter in pan over medium-low to low heat. Pour in egg mixture. Using knife or whisk, spread out cream cheese dabs so they aren’t all clumped together. Let set for a minute or two. After eggs have set; stir ONE time. Just once. This is very important! Over-stirring scrambled eggs is the mistake most people make. The LESS you stir them, the fluffier and better they will turn out. After another minute, stir ONE time, then add shredded cheese. Wait another minute then stir once more. Lower heat if necessary. Preparation time: 5 minute(s). Cooking time: 10 minute(s). Number of servings (yield): 8.